88: Xanatos Gambit? No, this is a Delta Gamble! Delta awoke with the scent of dusty castles and blueberries filling her nose. The castle part was easy to understand but she struggled with the second. Opening two eyes, she was sure she had been lost in some black thick forest. She moved slightly and the mass wriggled in response. Oh God, she had been eaten by some monster that smelled of blueberries! What next, was its cousin going to come accusing her of reeking of elderberries?! She shot up and blinked as her head left the sea that was Ruli’s hair. The woman yawned and grumbled something about skinning knives and chickens. The woman glared at her core with beady red eyes. “You were keeping me warm, do a gal a favour and float back inside for another few hours?” the woman asked politely as if her request was rather mundane. “What happened? I remember captain sour fudge and Fran... then I kinda smelled frying magic and I thought I heard Sis talking... what happened?” she looked around and Devina who had been sitting there, knitting something from spider silk, looked up. “You made Sir Fran more powerful and he smashed the undead fool before having to go back to his room. Miss Ruli decided to fight the hordes of nightmares and only wondered why that might be a bad idea later,” the frog grumbled. “I washed my hands afterwards and it was only one horde!” Ruli replied sarcastically. Devina looked up and flicked one hand. A tiny green ball appeared behind Ruli, giggling before it exploded like a firecracker against the woman’s rear. Ruli yelped as Devina pointed and glared. “Sassing me is not wise right now. I had to stop Rale and Jeb from tossing Jack and his potions like an explosive game of catch and three more creatures tried to get through. One of them sniffed me and died on the spot because this damn blood elemental goop won’t come off!” Devina scowled. On her head, Inchy the bird tilted his head and his beady eyes glimmered. “You could say that if one more person annoys her... she’s gonna deliver her goop de grace!” the bird sang. Ruli burst out in guffaws and Devina’s pained face turned murderous. Delta had to admit... Devina did smell rather uh... ripe. She focused but since Ruli was here, her menu and core powers were highly limited. “You don’t smell that bad, I’ve reeked worse,” Ruli promised. Devina stared at Ruli and Delta saw she looked ready to cry at that. Instead, the frog woman inhaled and pulled out a round glowing orb with three bands of iron, pulsing a dark red colour. “Our prisoner of war doesn’t speak but it felt wrong to smash him up when he can’t defend himself. I brought him here for your judgement. Also because I’m sure one of the goblins will dare the others to swallow it whole,” Devina said bluntly. The blood goop demon that had soaked Devina looked rather harmless as just a core and Delta watched as Ruli took it. “Little bugger isn’t going anywhere without blood, and decent stuff at that. Smells like it formed a body out of cow blood last time. Explains why it didn’t do more than annoy you,” Ruli said and spun the core on a finger. Delta sort of felt a bit of kinship with it. A central power that built itself up by constructing a body and gathering resources... Would she be that helpless if someone took her out of her dungeon? “If we rebuild it... would it just go back to hurting people?” Delta raised the first important question. Devina and Ruli shared a look for a second. “Depends on what kinda elemental it is. We know it’s blood, but the actual nature we don’t know. If it’s a golem type then it's gonna be following the last official orders it got until it’s dust,” Ruli said bluntly. Delta blinked. There were types of Blood Elementals? Besides A type, B type… Delta shook those thoughts away and focused. “If not... then it's a spirit type. That’s more manageable and more complicated. I’ll take the little guy to town, and if it’s a golem I can ask Japes... if not I’ll have to go see Madam Ghu. She would know the most about spirits because she's-” Ruli bit her tongue as if suddenly remembering something. “Ghu is cool, she’ll take a look,” Ruli amended. Odd but Delta didn’t push it. “Thank you. For helping us I mean,” Delta said and bowed her head with gratitude. Being so close to her core really made talking to Ruli easy. Delta’s smile lasted a few seconds before her mind replayed that last sentence over and over. Talk to Ruli. Talk to Ruli. Talk...to....Ruli. “You’re… we’re...” Delta’s voice trailed off. Devina knitted a sleeve with a sigh. “And the shoe drops,” the frog mumbled to her bird. Ruli was also grinning, evidently she wasn't going to say anything about it, but now Delta had noticed. “Hello, Del, nice to finally see a face to go with the madness,” Ruli winked. Delta slowly put her hands over her mouth. Stupidly, she felt scared that if she wasted words now... any words, her chance would be gone and her chance of human contact would vanish. Ruli raised one brow. “You nattered on before, no different now. Just two friends chatting after routing out evil bonies from your basement... just be yourself,” Ruli assured her. “The Mushrooms weren’t my idea!” Delta blurted this out so fast it was almost as fast as a magical spell spoken by a masterful wizard in the heat of battle. Ruli blinked. “But they’re your thing. Everyone knows you got shrooms for days,” Ruli scratched at her nose. “The monsters were all accidents but good ones! And the system made me gamble on Bob and others! I didn’t know Waddles was an overlord duck!” Delta just talked. Her words raged up like a storm and she couldn’t stop. “I want to be a good person and I keep making really strong things but then I kinda like them but I also really want to make a home but I keep digging things up and you need to bring that Grim kid back so I can chew him out for calling my Dungeon lame!” Delta was running out of air but she pressed on. “Deo is too...pure...for this world. Spiders...handled....explosion not my...fault....not my fault....I’m just... a girl... doing her best,” Delta’s chest heaved and she slid down to her knees to breathe heavily. “That’s fine. You’re doing a good job,” Ruli said simply and tried to pat her shoulder, the touch lasted for a few seconds before it broke apart as her hand went through Delta’s chest. Ruli stared at her hand sticking out of Delta’s torso. “Usually I ask for consent before being this deep. Sorry about that,” Ruli withdrew her hand and grinned. Delta smiled in appreciation of the bad humor, but the air suddenly felt...cold. As if the sun had fled and the cold earth surrounded them. “I insist you desist... molesting my mother!” Devina towered up from behind Delta. Ruli stood and crossed her arms. “But we’ve slept together and I’ve just been inside her. I gotta at least buy her lunch or talk about being a proper suitor and taking her on dates,” Ruli said in mock horror. Devina’s tone could have made ice look hot. “My mother has no time for thugs. She has children to look after and chaos to cause!” Devina thundered. Delta felt very small between the two giant women and began to crawl towards the door, to the safety of men. She was not dealing with this! She was panicking, wondering how to escape without being noticed because the door was shut! Her mind clicked and she nearly slapped herself. She phased through the door into the feast hall. Most of her monsters sat in what was… once the feast hall. Delta froze mid crawl to stare. This was still a feasting hall of some sorts but… jeez. Sis really let the system fritz out big time. Long tables with garish orange cloth were covered in basic plates of rabbit, bacon, sausage, mushroom soup, mushroom toast, fried mushroom, and a large platter of ham sandwiches along with some freshly wrapped chocolate bars. Delta hoped to god no one shortened that brand name. A nearby table had punch bowls of various fruits blended down to pure juice and there was even a slow moving fountain of honey with crackers and bread sticks to dip in for a coating. From the ceiling hung long banners with blazing mushrooms on them. The mushrooms looked like they were about to reach a new level of power. Delta had a sinking feeling that was her symbol of sorts. She managed to get far enough to see on another table with various selections of sushi and freshly sizzling fish on plates. Most of them looked to be copies from her first floor. The fish was covered in a light drizzle of some kind of oil and it made the surface of the meat look juicy and plump. It had all been deboned with great care. Someone had taken the time to rub various herbs from her second floor on to the various rabbits and fish to make the room fill with a smoking meat aroma that followed with a light herbal scent. For sides, the Dungeon had provided mashed potatoes and various tiny silver pots of thick gravy that hinted at beef and pepper. Delta forgot about hiding and just stared in wonder. Another table showed off fresh apples, next to them were cooked apple fritters, and some attempt at a hot apple crumble. Another punch bowl filled with apple juice looked pure and untouched by anyone. Next up on the list was a table covered in the various birds of the jungle. The sheer amount of dishes that displayed some form of bird being grilled...fried… sliced to match the ham sandwiches, and even marinated in various mushroom sauces, filled the hall with the most amazing scents Delta had ever smelled. She wanted to open the menu but the sound of animals came from behind. She saw Rale, Cois, Billy, Numb, and Jeb all cheering as Jack was lowered into the honey fountain and they all began to count to see how long Jack would last. Dear lord, she had made enough men to make a fraternity house. She turned and sure enough. Made with royal honey, Delta’s Dungeon now boasted Honey mead. Delta would appreciate the compliment if the dozens of bottles littering the floor weren't all empty. “Idiots. Aren’t they?” came a gruff voice. Delta spun to see Fera standing there. Her face unamused as she eyed the mess. “You left the bar!” Delta said in amazement. Fera gave Delta a long look which suggested she had just added Delta to the idiot list. “No, I expanded. The kitchen here is part of the dungeon now. It connects to my bar and I rode the dumbwaiter down here,” she explained and scowled as Jack hit the floor and stuck to it. “So, this is all on your menu now?” Delta looked around with a slight drool. Fera nodded. “Buffet style down here. Thought you might want those idiots you call adventurers to get a reward for beating Wyin, the sour cow. It’s unlimited, so it’s not a hassle to respawn. Besides, I got a helper now,” Fera said smugly. Her face fell before she barked at Jeb who was stuffing his face with mashed potatoes. “JEBEDIAH! THE SOUPS BOILING OVER!” she yelled and the troll jumped in alarm before he turned, stomping his way back through a large door in the corner of the room. “Rocks for a brain but he follows orders like a soldier. He can only cook that troll soup gruel so it’s going to take time for me to train him up to handle proper mushroom soup,” Fera admitted. “Isn’t it just boiling mushrooms in veggie mix and water?” she asked confused. That made Fera’s face turn dark. “Should be. I had to kill what crawled out of Jeb’s pot on the last attempt,” she grumbled. Delta had no words for that. Nina gathered her clones into one as they finished emptying the dishes into the sink. She watched as the usually quiet bar owner, Nibs, paced behind the counter. That was odd. Very odd. “You okay, boss?” she asked as she split into three once again to serve a drink, collect more plates and to talk. Three pairs of eyes, three lines of thoughts, three people she could be....forever... but she pulled that thought away and focused on Nibs. The slightly round man had a beard that, if one peered too closely at it, one might assume had its own little beard. Nina had offered to cut it once and she had been barred from her own place of work for a day. Nibs was someone who was blunt, honest, and looked like he had been custom-made for the business. Nina wasn’t even sure that was a joke. The man never slept. The man didn’t eat... the man didn’t even eye her rear up like in all her other jobs. That’s why Nina always acted like the bar was alive. Listening...using a puppet in the form of Nibs to talk to people. The man looked so perfectly stereotypical like a bar owner that he couldn’t be real. Nina had stayed mostly because of the good pay, the way Nibs didn’t tolerate any abuse aimed at her, and to solve this mystery. Oh, and it being the only bar in Durence helped as well. Sure, there were other establishments that served drinks, the Milk Bottle for one, but it wasn’t a bar. It was a public milk house. It didn’t upset Nibs for some reason. “Got a new one. Pretty out of the way but its growing too fast! It’s like a slap in mah face. I can feel that it's menu is all off-balance. No veggies or duck. The tables are all too new… sets me teeth on edge. Only a few different drinks! What an arrogant place...But the owner...” Nibs stared out a window and Nina waited for him to speak. Baffled at the random facts he was pulling out from somewhere he had never been. “That owner has a real bar spirit. Usually new pups make me feel a toothache. All sore and endless, but her? Nina, this uppity newbie is making my heart race. She loves her bar,” Nibs declared. He turned and pulled something out of a drawer and began to scrawl on it. “Quiss is due for a drink soon, grab him or that idiot friend of his, Seth to go spelunking. I need you to deliver this letter!” Nibs ordered. Nina took the sealed note between two fingers as if it was going to bite her. “But what about work?” Nina protested. Nibs eyed her two clones. “Just leave them. I’ll wait for you,” he promised, and ushered Nina towards an oncoming Quiss. The wizard looked furious as his face was covered in soot and burn marks. His Mana flashed and threatened to explode as he glared at them. Even Nina was in danger from that, and she had no desire to return to the mess she had been before. She might have to train to get her Mana to higher levels before long. A Nina Hivemind was not a cute thing to see in action. “No. Whatever it is. No,” Quiss shut them down and stalked to the bar. Nina wasn’t sure she imagined stools slightly moving to avoid him or drinks pouring themselves before Nibs actually touched the lever. Okay… she needed someone whose Mana hadn’t plummeted and was now rising like a dragon on gnome crack. She went looking for Seth and prayed he had grasped the language a little better. “You wish to... give letter...to new drink place?” Seth said after a moment. Nina’s hopes rose and she carried on. “I think my boss has a crush on the new place and wants me to scope out his darling,” Nina admitted. “Your leader wants to crush new drink place? Scope...scope...as in watch? He wants to see new drink crushed for daring to be? !” Seth said in alarm. Nina was quiet for a moment then shrugged. “You know what. It’s not the right crushing but I bet Nibs would do that if he doesn’t like what he hears. But all you need to do is come with me to deliver the letter!” she beckoned. Seth waved it to Isanella who was watching them with delight in her eyes. Seth was having tea with her. What they would talk about, Nina had no idea. “May… I come? Deo is out with his friends and I have nothing else to do,” the woman asked. Nina blinked and tried to remember if she had ever heard the woman speak before. “Sure, open party, looking for a healer now but we’ll take a bard,” Nina joked. Isanella thought about it. “Delta is a sweet girl. I doubt we need a healer. I can spend time with Maestro and practise my new instrument!” Isanella said brightly and the room felt melodical and sweet as if her mood was infectious. She plucked a lute that looked to have had mushrooms on the mind when being made. Seth peered at the mushroom motif and nodded. He patted his stomach and it growled. “Round squishy headbulbs make for good mouth party!” Seth beamed. Nina nearly spat out her tea. “Can’t you teach him or find someone to help him learn the local words?” Nina asked the smiling woman. “I can understand his music but I’m no good at teaching. We just hum at each other and sometimes he slips into the tongue of magic which I know a little bit of,” Isanella explained. “I just feel like he's going to say something bad to the Dungeon and it’s gonna be my fault,” Nina sighed. The petite woman giggled. “Dungeons understand all languages that are in common use, most creatures and even most intents. Most just don’t care to respond,” Isanella stood and grabbed a yellow cardigan. That was news and Nina leaned forward as the woman kept talking cheerfully as she began to pack lunches for them all. What a mother. “Dungeon Cores take in ambient Mana, a lot of the world’s Mana flow on the wind and from dense places. In a lot of areas, the Mana mingles and it whispers words to each other, spreading itself so Dungeons learn more about many things!” Isanella packed the food into a basket and covered it with a red cloth. “Mana talks?” Nina said doubtfully. Seth merely hummed and that made Isanella giggle. “Seth thinks you sound like a negative nancy. I’ve been to such places. Where Mana mingles and spreads to the corners of the world. Such places are called Ley Lines. They are powerful and if you use a map, many Dungeons are built along one or more Ley Lines!” Isanella hummed as she spoke. “What about here?” she asked. “For a powerful thing like these lines, Durence sure had been tapped dry,” she pointed out as they began to walk down the street. “Our Dungeon seems to have been built on a dead line,” the woman went quiet. “How does a line die?” Nina pressed on. The look she got was haunting. Nina only had one thing to say. Ruli left with enough bacon and eggs to feed an army. That alone made Delta feel better about helping to pay the woman back for coming to her aid like some demonic super hero. It wasn’t nearly enough, and despite Ruli only going to the first floor to drink (on the house… dungeon?) it still meant Ruli was closer to leaving than hanging out. Ruli’s demon nature, whatever it was, let her see Delta far more clearly than she suspected normal folks would. After an endless time of no real sleep other than the times a floor appeared or she broke the system… Delta was beginning to miss talking to people she hadn’t made or found in her basement… or unearthed in a spooky circus or exploded down a soul level. Delta pursed her lips. It felt like so much time had passed when really, the eight hours of sleep she no longer needed just made everything go on forever. As soon as Ruli reached the second floor... Wyin too lost in her own world to even care about the woman, Delta felt the system rushing to bombard her with notifications. “Order! Order! One at a time,” she barked and all the appearing boxes hastily shifted into a neat queue. The first one was interesting. She hovered in the air and got ready for some reading. Where was Nu? Shouldn’t he be her secretary for all this? Planning a small-scale war. Unless you want to deal with convincing Cois that he needs to aim or Jeb that he needs to think longer than three seconds or Rale to stop flexing? Delta eyed the boxes as Nu appeared and grabbed for the first one. The first menu simply gave her the results of reaching the Third Floor. A series of connecting halls, rooms, and stairs that challenges an adventurer to adjust from the tricky creatures of the first floor and the wildness of the second floor. This floor can be considered an even battleground, but the foes you can place in their path do not have to be human. Monster unlocked! Troll! One slot left open. Second monster found! The Dungeon can now make Gargoyles! “I have no memory of consenting to this,” Delta accused. The box shied away but didn’t do anything but give her the menu of the new beasts. Gargoyles: Stone Demons of the sky- er ceiling! Not to be confused with grotesques which are simply there to look pretty. Gargoyles are walking animated statues that can switch between an earthy flesh form and a stone form that is completely without energy or life, making them expert ambushers. The energy of the gargoyle is usually a spirit or a magical core but in this case, the ‘goyles merely eject their mana selves from their body and cannot be seen or harmed. In this state, the gargoyle’s physical body are treated as objects in Dungeon space. It was how they were absorbed. It was a big info dump and Delta summed it up in her head. Potential rock monsters be stone or not and ambush people. They are aware because funky magic business. May look weird. Delta made a note to summon a gargoyle soon to test out how she felt about them. Thinking about the Lure Lizard and the Slimers still repulsed Delta to a degree and she was suddenly hit with a weird feeling of time flying past. She thought of her first floor... and the idea of changing any of it... to lose those memories of her time there made her chest tight. If she just messed with things then what she had done and what she had felt would be lost to this weird time lapse. Minor upgrades and keeping the foundation sounded nice for now. So, if the goyles (Delta’s name for them) turned out to be a bit crabby, then she would keep the lone one and move on with more trolls. The next notification was for the Feast Hall and her battle inside it. Well, Fran’s battle. Delta just cheered and fiddled with some options. Turning on a cheat code by accident. Enemy captain defeated! Core Mana leeched. Corruption resistance is improved! “Sis, I’m no warrior. Just give that task to Nu,” she protested and the box fizzled then faded. Relieved, she focused on the next box. The Feast room has been converted into The Banquet Hall. “But that’s just the same room with a different name,” Delta pointed out. The box twitched for a moment. “But now we’re lying. No bar here sadly,” Delta said and the box began to twitch a little faster. Please insert name while the system goes for a coffee break. Delta rolled her eyes at Sis’s sass before she mused. Fera looked up from her task of dodging blinding beams of light from starlight mushrooms as she tried to force them into the cooking pot. The dumbwaiter labels had changed to show the new name. “Free Heal Hall? Really? I guess ‘Extra work for Fera’ is a bit mouthy,” the goblin grumbled as the connecting dumbwaiter began to leak a thick black sludge from Jeb’s latest attempt at cooking. She sighed and got her boomstick. Free Heal Hall or Free Heal for short felt just right in her head. It was like that free healing spot before or after a boss in some games. Delta was sure her food, while delicious, could not heal actual wounds. She eyed the tables and rubbed her hands in anticipation. “Not yet... but I’ve managed weirder things,” she admitted. How hard could it be it to replace the typical herbs with medical ones? Wine mixed with magical grapes? Cake that didn’t make you fat? Okay, that last one may be even beyond the System. Still, a girl could dream. She hummed and twirled along the hall as she hummed. “Maestro, have you made it down yet?” she called aloud. From underneath the tables came a cat call whistling. “Not even the worst monsters of this world could keep me from taking centre stage! How can I please your ears today, Mother?” Maestro sang and the floor vibrated. “I can call you Betty… and Betty, when you...” she waited, interested to see how far Maestro had learned her music. Maestro began to tute a flute and the floor hummed. “Call me Al! A fine choice if I do so say myself, Madam Betty,” Maestro took off and the song filled the halls and Delta giggled, skipping along to the beat as she planned. There was something just fun about filling the place with music and laughter. A tiny slap to this Silence nonsense. “Take it away Mister Al!” she laughed. She could feel the Mana slowly taking over the garden beyond the hall. Soon, that would be even more space to work with but she tapped her foot to Maestro’s jolly voice as his beat was on point to the song she remembered. Her eyes flicked to the menu that followed her. Free Heal Hall: A mighty feast for the brave and victorious. A hall filled with various foods made from substances found in the dungeon. Pretty tame options. Delta was a little bummed not to see a hall guardian but she assumed she was getting some version of a breakfast monster meant to feed a family. Some Together-breakfast beast. Truly, the most important meal of the day... and the deadliest. Speaking of potential guardians and purchasing... Delta whistled innocently as she floated towards the stairs. Feeling nostalgic over the first floor had made her remember that she had forgotten about the chance to purchase a random guardian for the toll well that connected Waddle’s Pond to the Fort room! She flew past a singing Wyin and blushed a little as she noticed Maestro was broadcasting her song choice Dungeon-wide. Ah well, the bees were partying it up and Bob was wiggling so hard he was like one of the dancing things outside car shops. The paradise birds of the jungle and the various rabbits and trick foxes were also hooting and yipping along to the song. Honestly, she felt like some princess... that could fly and summon monsters but still, it was a fun feeling. She shot up to the first floor and peeked in on Fran who was sleeping in his cave against Bacon’s stomach. She really was going to make Fran a decent room once Ruli stopped drinking and left the Dungeon. Speaking of the giant woman, who Delta regarded as her... closest friend from outside, she was enjoying Delta’s reward of free drinks with great pleasure. “Then I <pow!> Sent the wolf flying so hard it exploded!” Ruli told a blank-faced Fera. “I keep feeling like I should be responsible and cut you off but if you get drunk enough, you might drop more tips that aren’t rabbit bones and naughty jokes,” Fera mused. Ruli burped loud. “Jukebox monster! Turn the tunes up!” Ruli said with a huge grin. Maestro seemed only too happy to blast the flute solo as requested. Ruli cheered and went back towards the second floor with her drink to bask in the faux sunlight. “Maestro, line up ‘Jump in the Line’ next,” Delta whispered and the mushroom glowed with pleasure at the request. She snuck past and floated down the toll well to see the dark tunnel. She looked around with a guilty expression before pulling up the menu and hovering her finger over the Guardian buttons. Delta moaned at her lack of self control before she giggled and paid the cost. The light gathered in the halfway submerged tunnel. Orange, of course. The ball of light burst and something fell to the ground, splashing heavily as it hit the water before settling. Delta had prepared herself for many tentacles or heads... or heck, she would have bolted at the first sign of something with suckers. Instead a roundish purple thing laid there as the water mostly settled around it, submerging it besides a tiny island of shell. Delta blinked at the innocuous monster and prodded it. “Hello?” she called. Her touch slightly rocked it and bubbles began to ripple to the surface as the seam of it’s two halves began to open. Delta leaned in eagerly. There was a pause then the shell snapped open to show a pile of coins, pearls, gems, and a collection of tiaras. The shine and luster of it all was spectacular. Delta was so shocked that she leaned in closer. That was when the pile of coins shifted to reveal a grinning skull, the bottom of the shell was filled with various skulls and the top of the shell became ridged with barbed teeth. Delta screamed and phased away with a yelp. The monster lowered itself into the silt and blew bubbles out in what Delta guessed was it’s attempt to be cute. She glared and opened its menu. Sunken Treasure Mimic. Its gleam leads many a greedy person to a watery grave. It snaps to show affection, not many survive to appreciate this. Delta was not sure how that came across. The clam opened again and showed Delta it’s treasure and tried to entice her to jump in as if to join the collection. You can’t help yourself, can you? Nu’s ringing made Delta turn, trying to hide the clam with her thin form and she laughed nervously. “Control? Me? Of course. I didn’t summon a man eating treasure chest!” she laughed nervously. You know you’re still see through, right? Delta knew this and turned her nose up at the idea of being caught. It’s got the intelligence of a dog. Do not fault it for being eager. I know you want to be liked and all that mush. Nu floated over and the clam shied away from the box as if afraid. “Cheerful, are you mad you didn’t get some murderous siren or sea snake?” Delta asked. Nu turned, looked blank then floated away. Your awareness of your ‘family’ is astounding. I don’t need those. I just need to make you gamble more. The results speak for themselves. The mimic will guard any treasure thrown down here with the tenacity of goblins eyeing a free drink. Handy for its purpose. Delta could see that. With its now exposed pink tongue sticking out the side of its shell... it was actually adorable despite trying to show her...affection moments beforehand. Honestly, it wasn’t that bad compared to some of the things Delta had made. She chalked it up to first floor normal vibes. She just needed to do one thing. Delta opened her menu and used various ideas to form a new item. It took a band of iron, some glass orbs, coiled metal and blue paint and cloth. Nu seemed speechless as the clam paused to admire the googly eyes that bobbed back and forward from the band worn like a headband. The point is to fool people into thinking it’s not a monster. You understand this, yes? “Ah but that's the plan. They’ll think it’s too obvious and decide it’s a trap or a trick and not suspect it actually is a trap,” Delta crossed her arms. Sure. Shall we call it Prince Clamrence? Sheldon? Clamrice? Nu was being sarcastic but Delta chose to ignore that and be the bigger person. 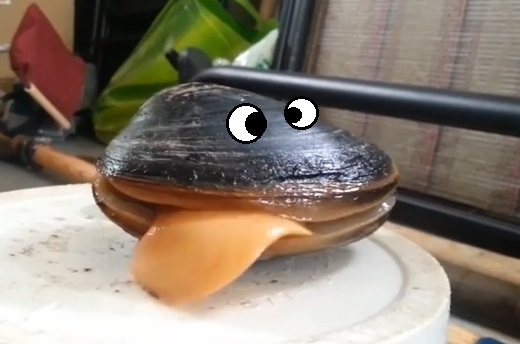 Room Guardian ‘Clamamity’ has been summoned! I better not being overfeeding you! Overfeeding... No such thing when it comes from such art!!! This person eats the meal! We're already turning into... an Ablobanation. BLUB! Mor chappies! Also, nice Gargoyles reference -- one of the best cartoons I had the pleasure to watch as a child, and re-watch as an adult. Ugh Fera is an idiot. Any food that requires censorships bars, especially ones that require them even while there is no visual depiction, should be dumped into the enemy part of the dungeon. They will either surrender after the second food drop or be in a state where they will never be able to surrender anymore. Yup. Just serve it up to the silent one. Or send Shione(Reincarnated as a Slime) to be its personal chef. The white flag would be up in a fortnight. Or that her mother was a hamster? Such a terrible curse. Delta might die! Oh wow, thanks for putting a visual for that up! Apparently gifs already exist that have foretold of the coming of Clamamity.